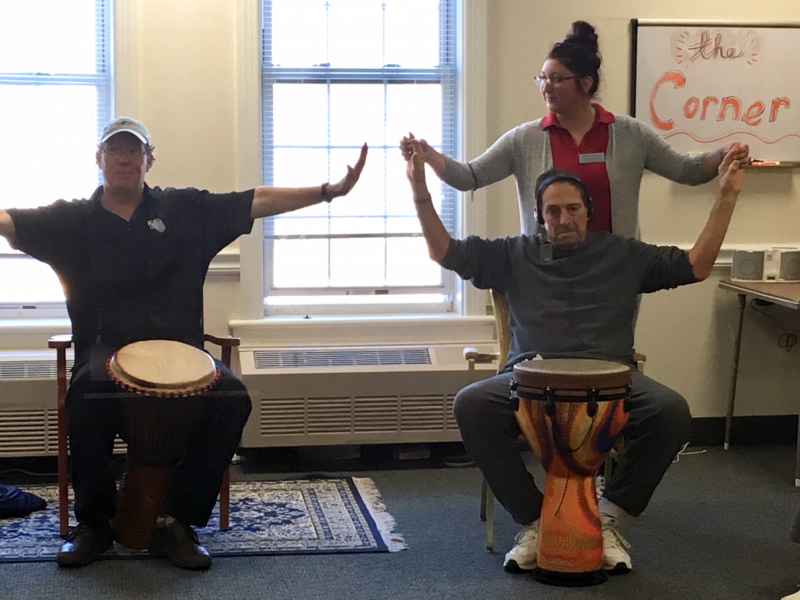 Yesterday morning we hosted a drumming circle led by certified instructor, Tim Kane. 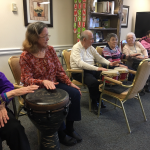 The program proved to be extremely upbeat… pun intended! 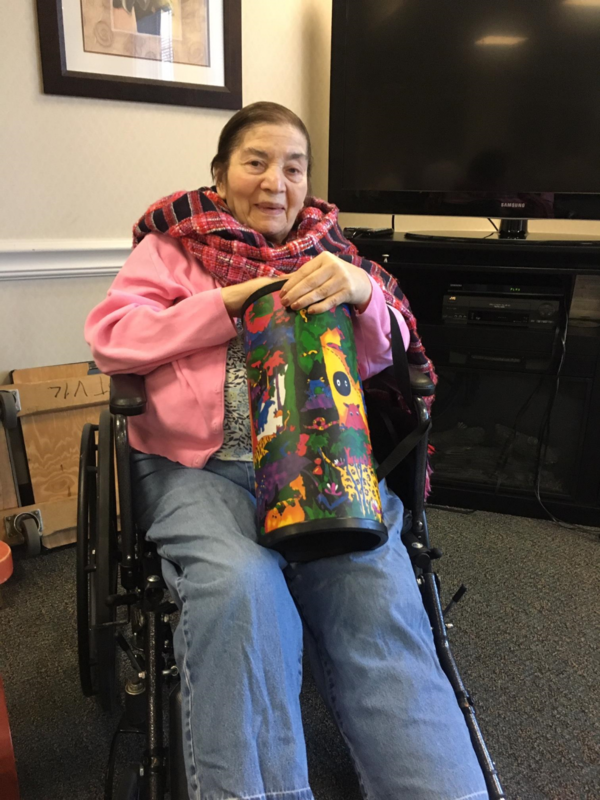 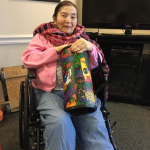 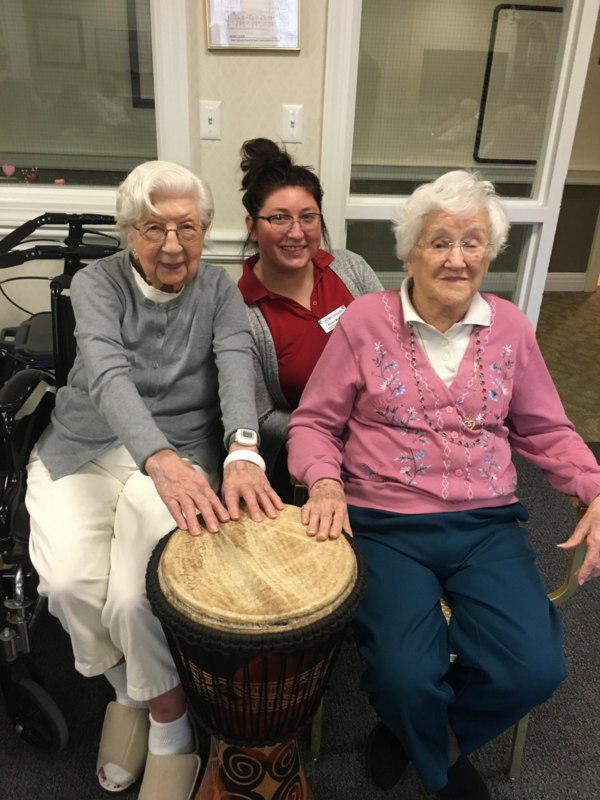 Residents gathered in the Wellness Room and each received a large djembe drum. 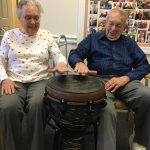 Tim explained the history of the drums to us, sharing that the drums originated in West Africa hundreds of years ago. 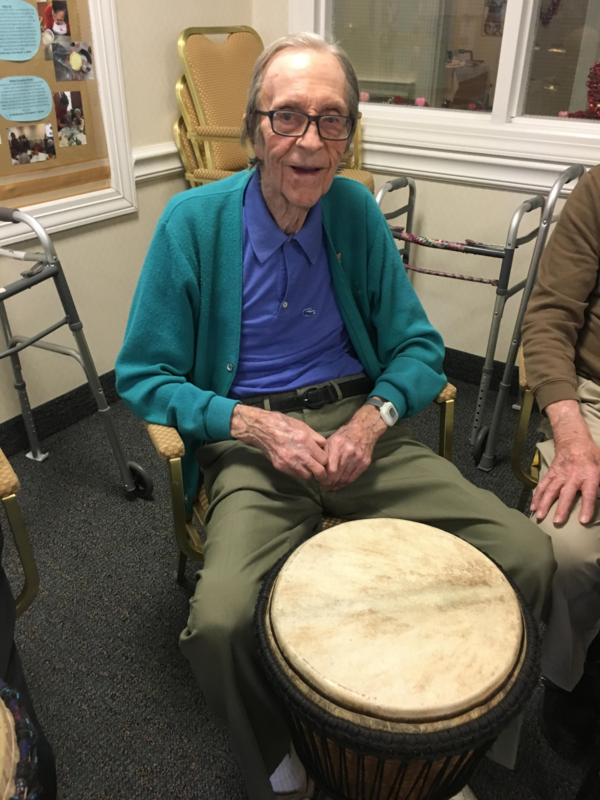 The djembe has a body carved of hardwood and the drumhead is most commonly made from goat skin. 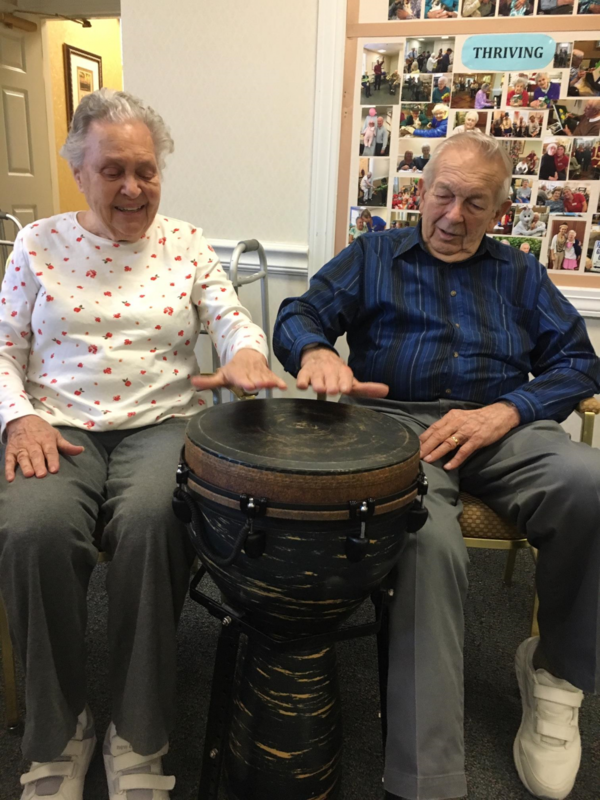 These drums can be played with bare hands and produce a wide variety of sounds, making it one of the most versatile kinds of percussion instruments. 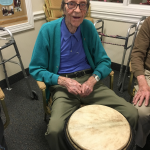 After explaining the composition of the drums, Tim began instructing class participants to start drumming a simple beat. 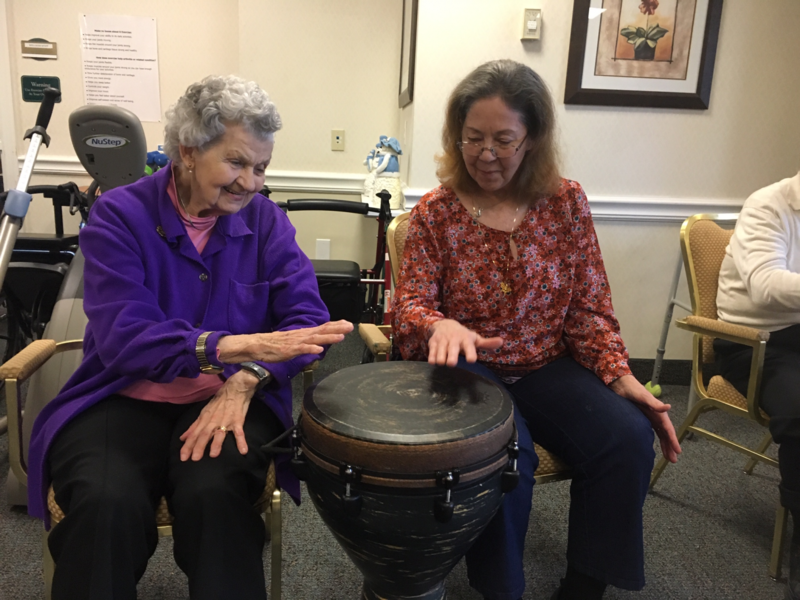 We tried a variety of different rhythms and played along to tribal healing music and even some classic hits from earlier decades. 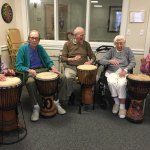 You could feel the energy in the room as everyone was laughing & smiling as they drummed along to the beat. 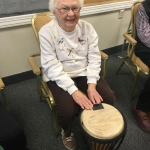 One of our Nayas, Annetta, entered the circle and began dancing and singing. 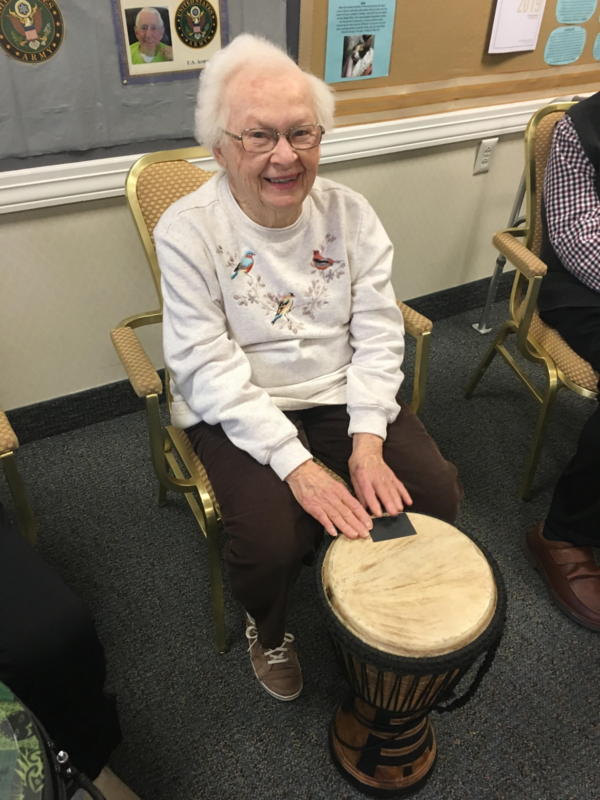 Not only was this added entertainment for the residents, but it also prompted one of our residents, Anita, to get up and join in on the fun! 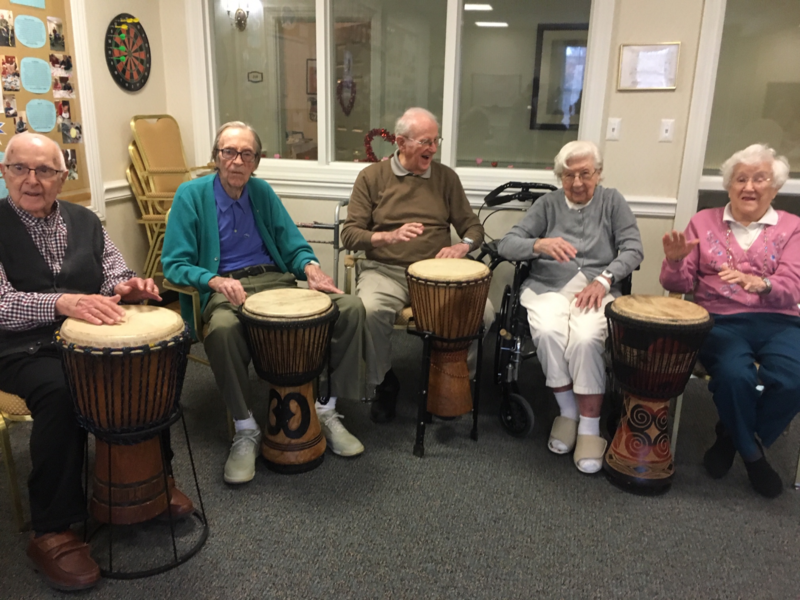 Drum circles are increasing in popularity and provide numerous benefits for participants including: increased energy, decreased anxiety & depression, improved joint mobility, and even stress relief. 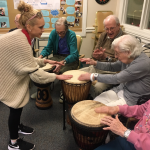 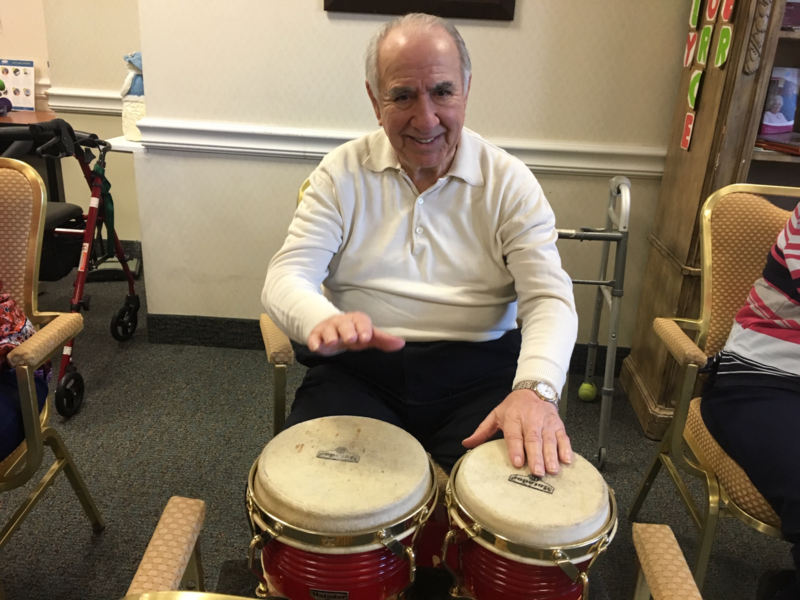 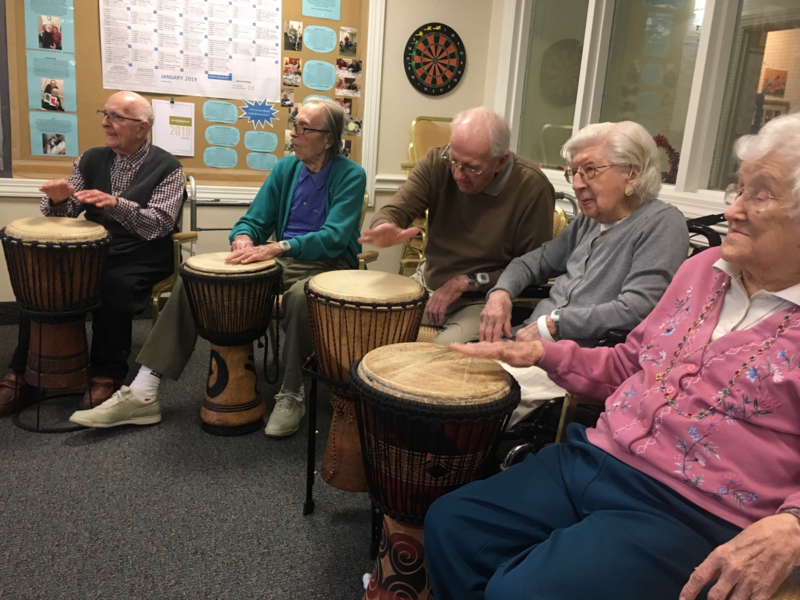 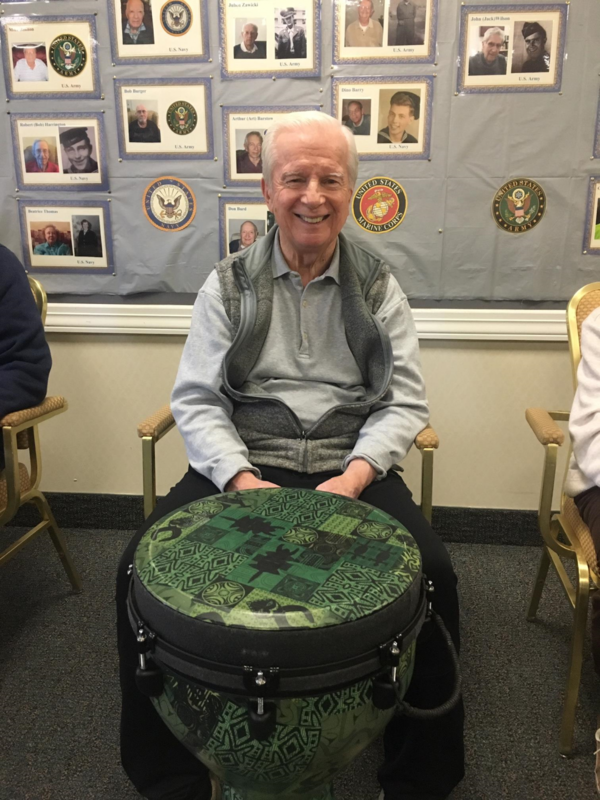 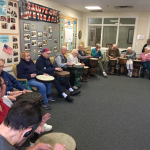 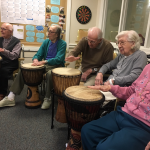 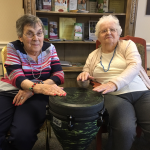 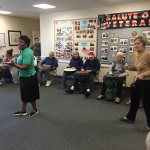 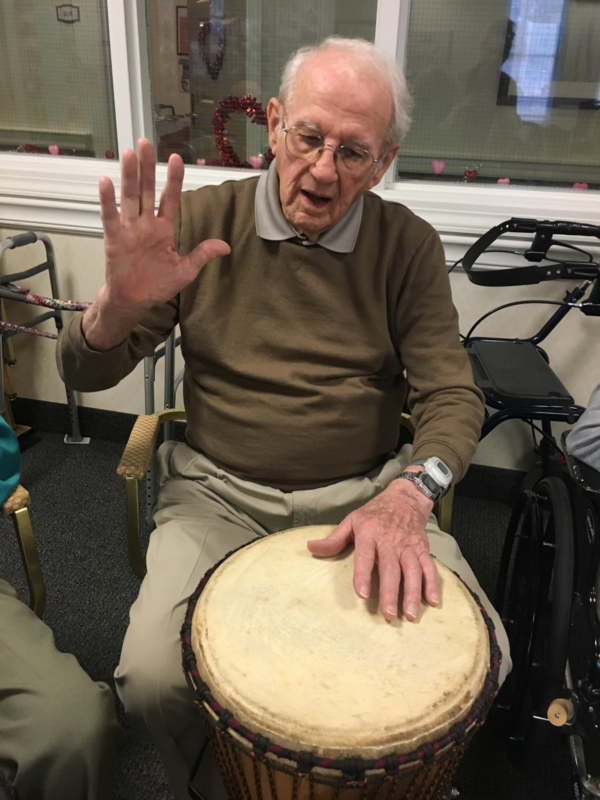 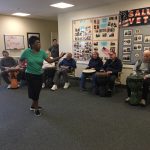 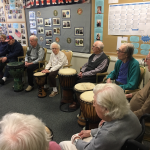 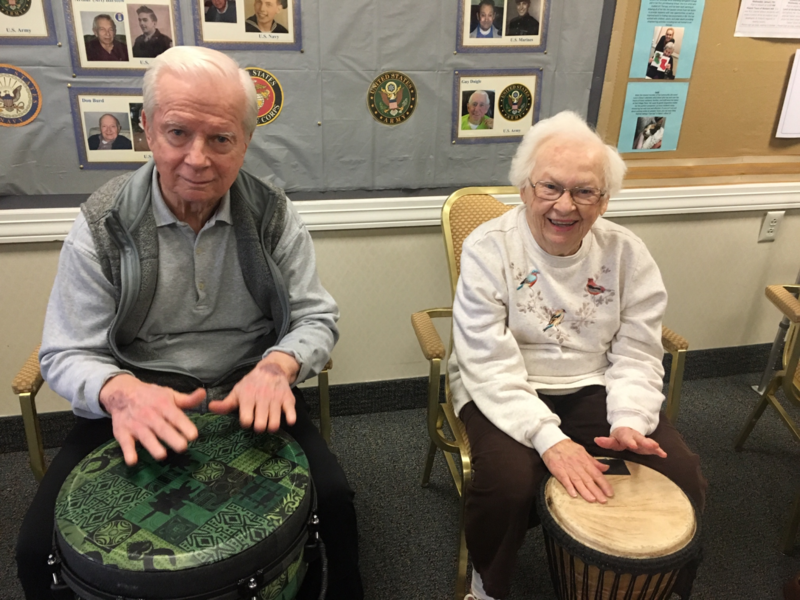 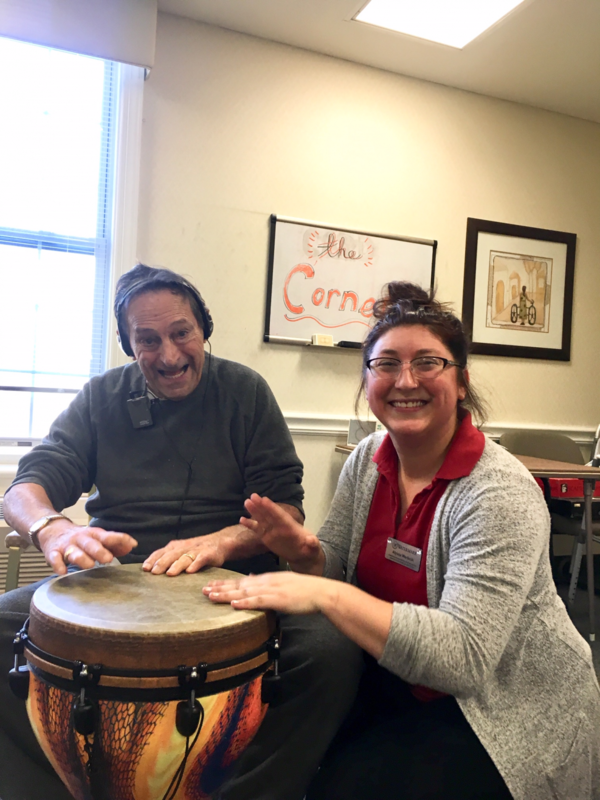 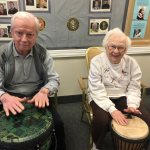 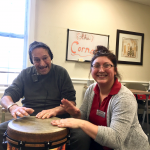 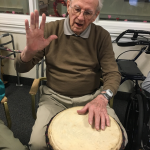 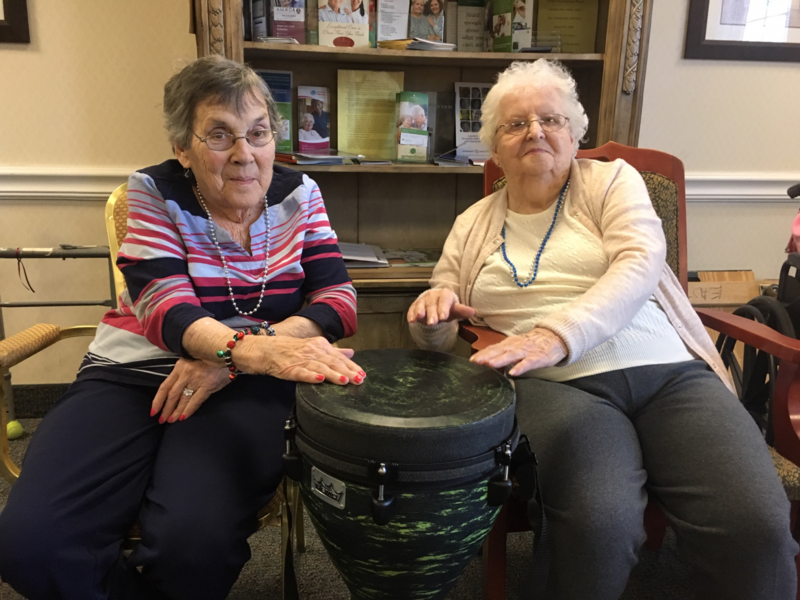 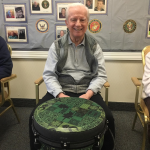 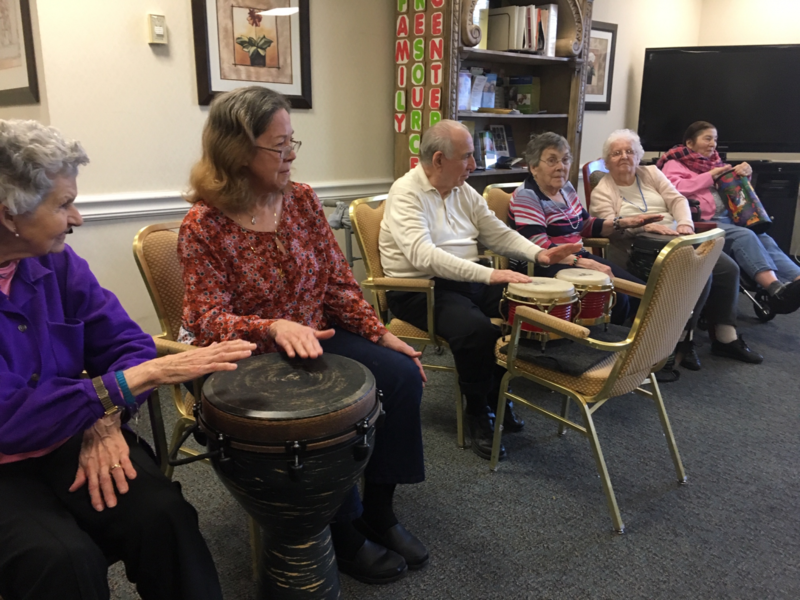 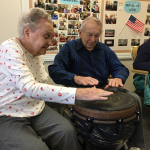 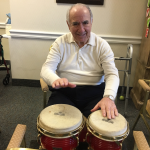 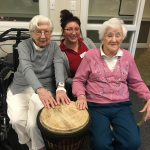 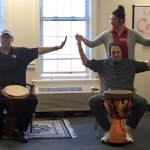 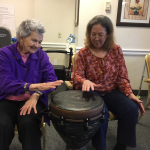 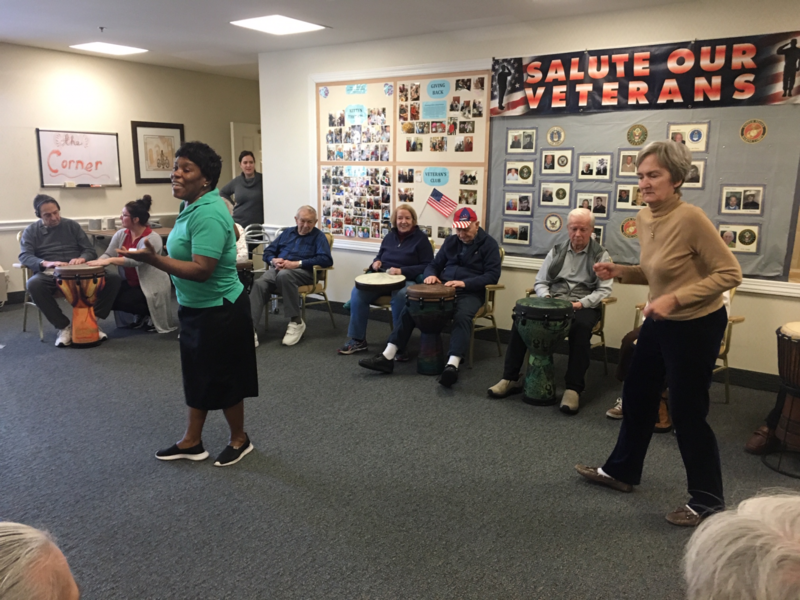 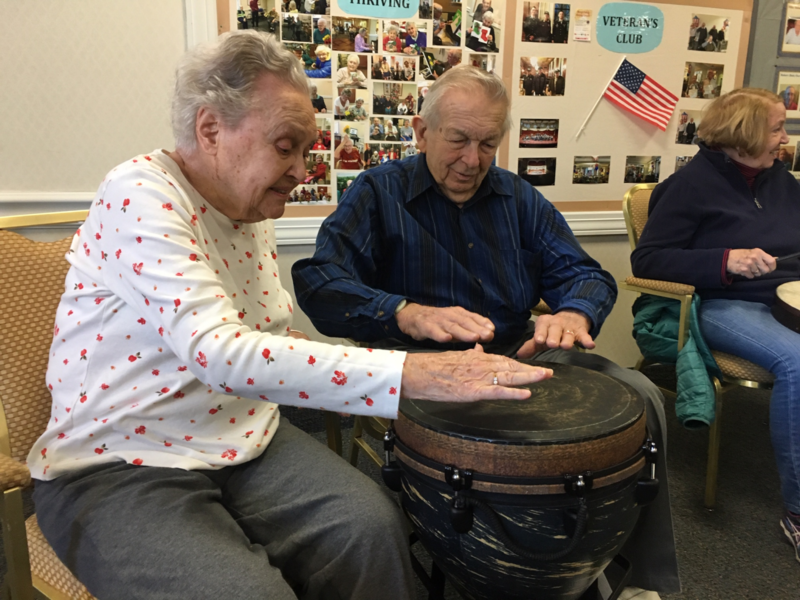 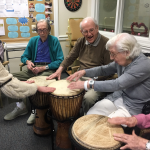 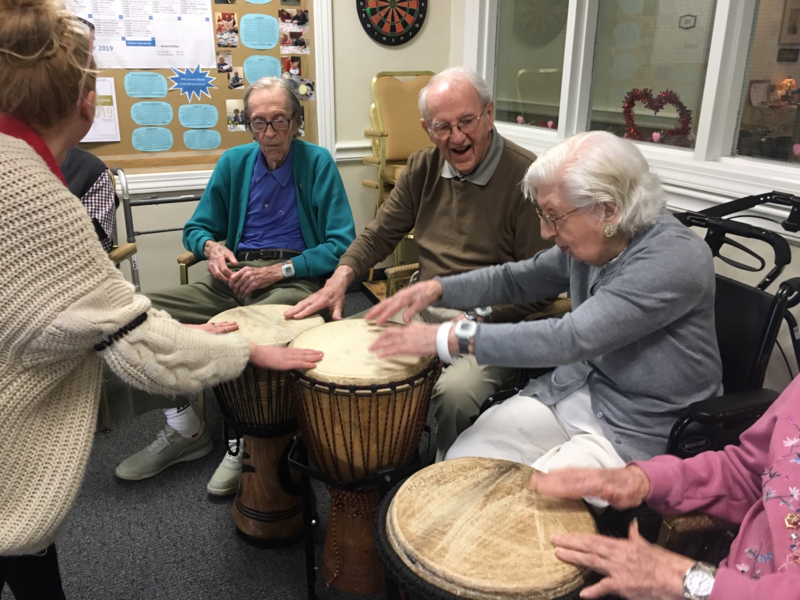 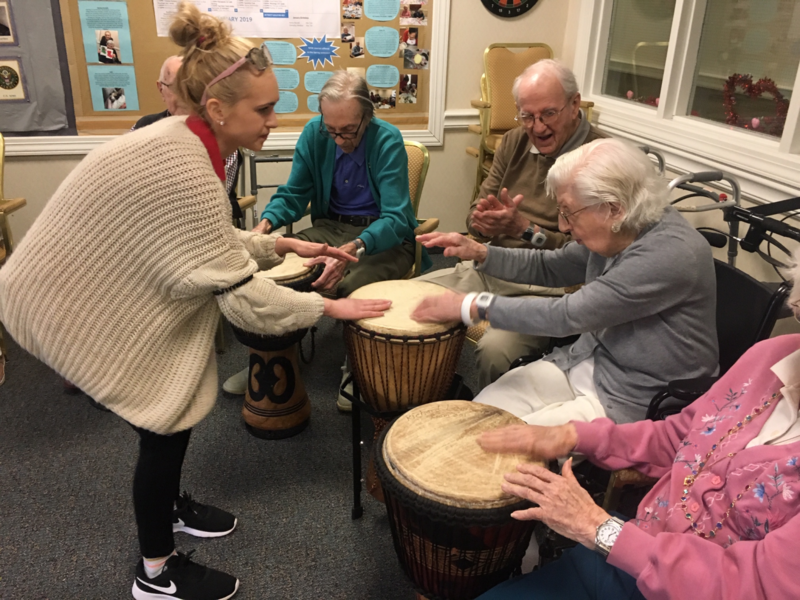 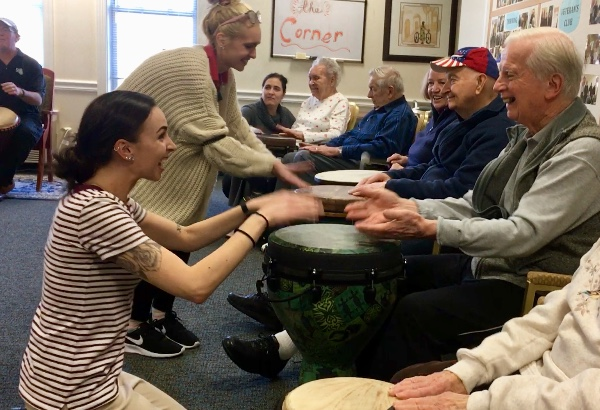 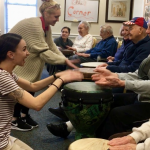 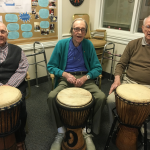 Not only is drumming a great form of physical exercise, but it also provides residents with an opportunity to make new social connections while having fun! 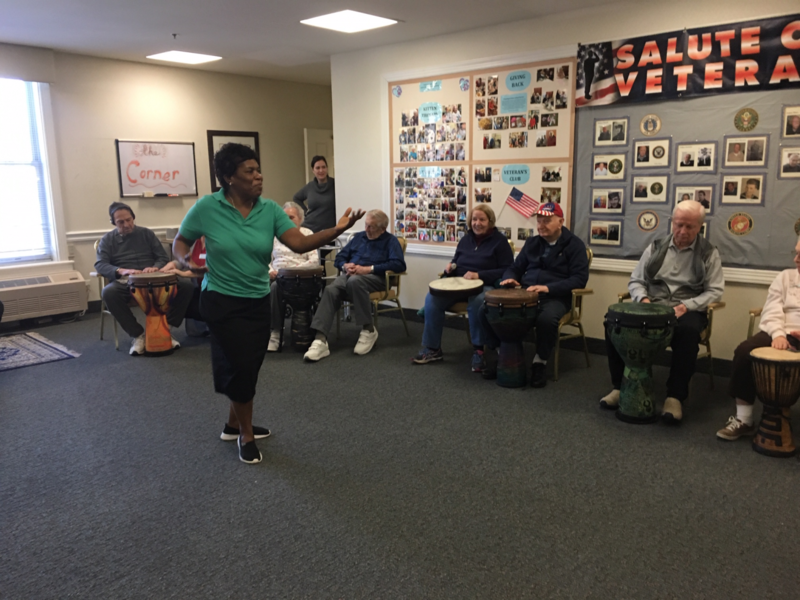 Thank you to Tim Kane for coming to East Village Place and sharing his knowledge and passion with us. 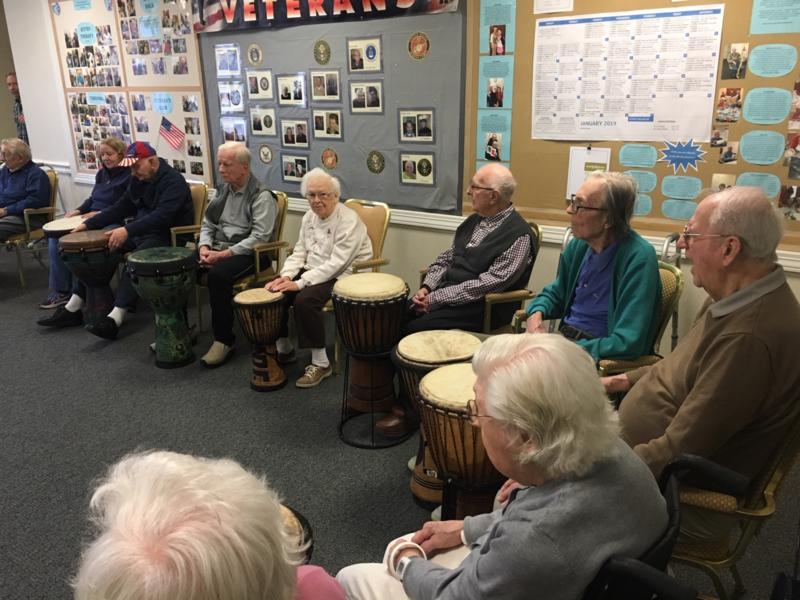 The drumming circle had a great turnout and received wonderful feedback, so we plan on scheduling another session for next month.. stay tuned for details! 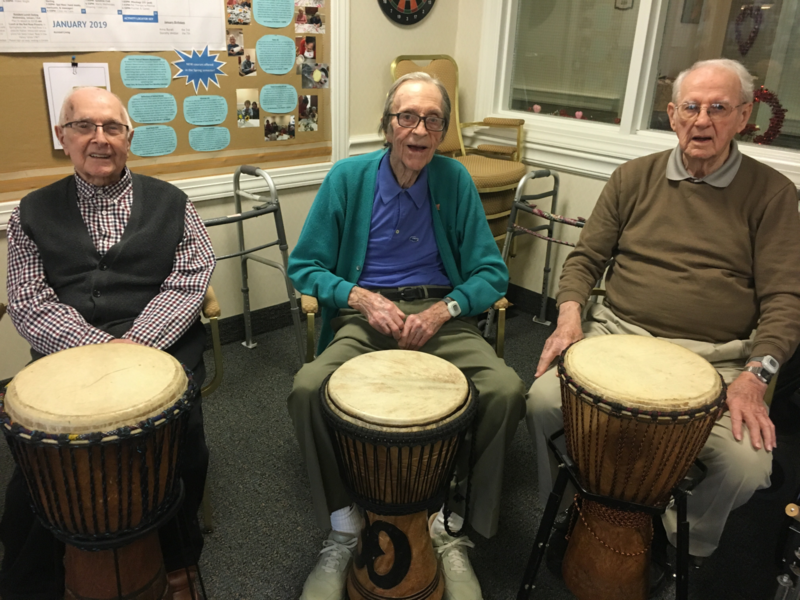 If you would like to read more about the benefits of drum circles, click here for an article from Tim’s website. 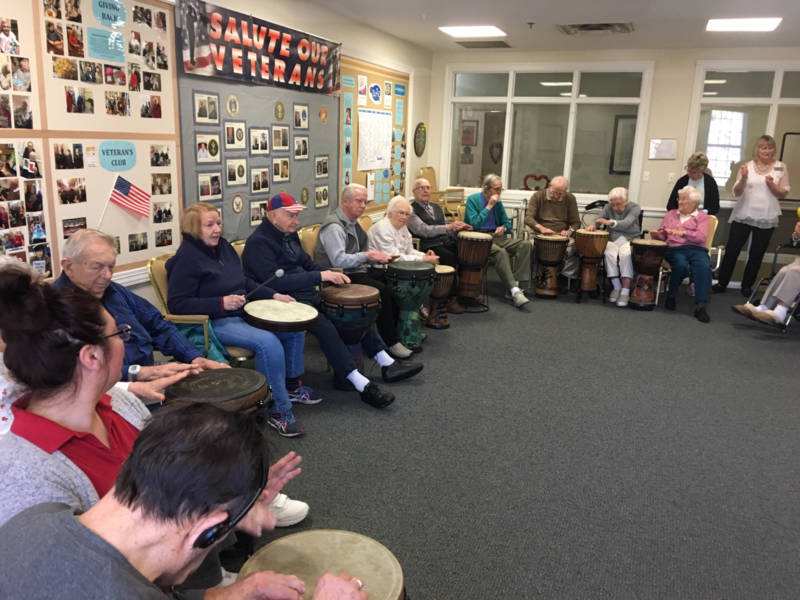 Drumming Circle led by certified instructor, Tim Kane!